Geophysicists have developed a new model of the Earth, 20 years in the making, that offers a precise description of the relative movements of 25 interlocking tectonic plates that account for 97 percent of the Earth's surface. Dubbed MORVEL for "mid-ocean ridge velocities," the new model is detailed in Geophysical Journal International. The work builds on a 1990 study describing tectonic plate velocities. During the past 20 years, researchers have incorporated more and higher-quality data to improve the model's resolution and precision. "This model can be used to predict the movement of one plate relative to any other plate on the Earth's surface," explains University of Wisconsin-Madison geophysicist Chuck DeMets. "Plate tectonics describes almost everything about how the Earth's surface moves and deforms, but it's remarkably simple in a mathematical way." This figure shows the boundaries of the tectonic plates that cover the Earth’s surface. The two-letter codes are plate name abbreviations; those in black are included in the model. Tectonic plates are in constant motion, sliding past one another as they float atop the planet's molten interior. The collisions and shifts can create mountain ranges or cause earthquakes like the ones that struck Haiti and Chile this year. "We live on a dynamic planet, and it's important to understand how the surface of the planet changes," says Richard Gordon of Rice University. "The frequency and magnitude of earthquakes depend upon how the tectonic plates move. Understanding how plates move can help us understand surface processes like mountain-building and subsurface processes like mantle convection." To judge how fast the plates are spreading, the team analyzed nearly 2,000 magnetic profiles of the crust formed at mid-ocean ridges in all the major ocean basins. The Earth's magnetic field changes polarity at irregular intervals — most recently about 780,000 years ago — and each time leaves a magnetic mark in the crust akin to a tree ring. Measuring the distances between the marks tells them how quickly new crust is being formed. Most plate boundaries are currently moving at rates of 15 to 200 millimeters per year, DeMets says. 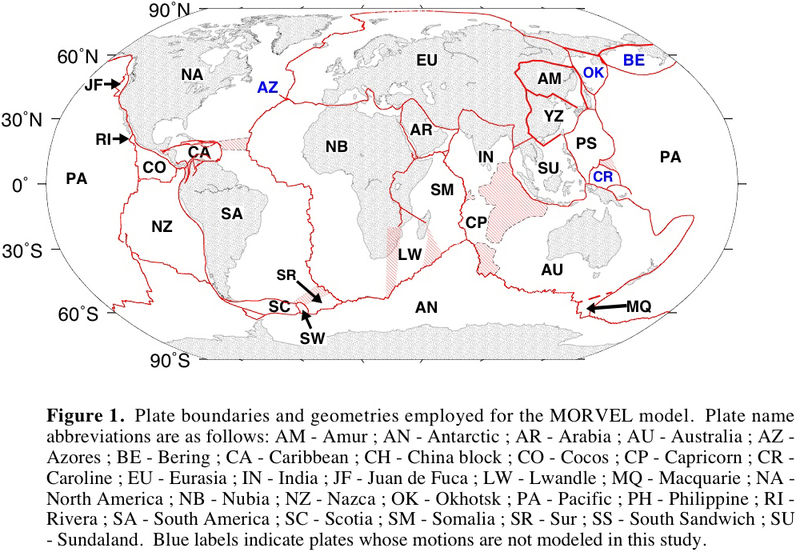 MORVEL also allows scientists to predict future plate movements and identify places where movements have changed over time, areas that are useful for studying the underlying forces that control plate movements. "Along the boundaries where plates meet there are lots of active faults. It's useful to know how quickly the plates are slipping across those faults because it gives you some feeling about how often large earthquakes might occur," DeMets says. "The direction of movement across the faults gives some indication of whether plates are moving toward one another, which gives rise to one kind of faulting and seismic hazard, or slightly away from each other, which gives rise to another kind of faulting and a different type of seismic hazard."